I saw this in the Holiday catalog and am surprised there is not a thread on it already! I am not including the thread for store invitations on Nov 23rd. This is online for VIP members. I presume one of the offers is the four minifig set after you spend $100. But it says offer*S* - what else is implied? Any idea anyone? My catalog does not have this in it, but I received the in store invite separately. Didn't they do a similar warmup to BF last year? ^ yes, they did. Same thing as last year. I was referring to the set from another thread - I thought it was Holiday Set#2, but maybe it is different. 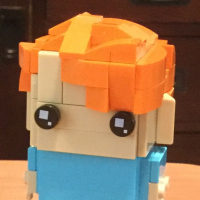 It had four minifigs in it. Cannot find it right now. Yes, last year was more "early bird" rather than exclusive. Never mind - DH just received his catalog, and there it is on page 3, with a smaller "why shop here" box. So, not every VIP member is getting this ad! Which catalog? I just received the Late Winter, and already have the Holiday one - both without the notice. What page number? I think it might be on page 2, as I have the right portion of the image on page 3 butting up to page 2, but in it's place I have an ad for free shipping over $75. Thanks. @cmrt1014, I just received the catalog today (Late Holiday 2013 Catalog), it is at the bottom left of the 3rd page on mine. Thanks, as you can see, I just picked up DH's catalog and there it is! Nor me, I don't normally get the coupons on them either, do you? I never get coupons but I have that VIP box on my page 3. So the question now is, can those who were determined by Lego to be terrible people and lower than pond scum (i.e. those of use who didn't get the VIP box on page 3), still get in on the goodness, or will it be tied to VIP ID? Confirmed. It was in the Late Holiday catalog. Can't wait to break out the egg nog and make ill-advised purchases at 12:01.
saw this in my catalog today as well, does anyone know what kind of deals Lego will have for this? I would guess it will be triple VIP and the #40083 for $99+ purchase like the stores will have that day. Have the triple VIP points been confirmed or still a rumor at this point? Is that the same deal as black Friday, just a few days earlier? Received the catalog and first thing I noticed is the "Just for VIP Members! See page 3." seal printed on the top-left of the catalog cover. Also there's a print on the back of the catalog - the right of the shipping address - that states, "Exclusive VIP Offers on 11/23! 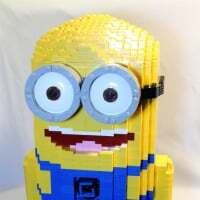 Only at shop.LEGO.com." 3x VIP would be awesome. Lets cross our fingers. Pretty sure this is open to all VIP members. Should match what stores are offering, the exception maybe the PaB box stores hand out for over $75 purchases. I really can't wait, it's as though TLG has created a warm and exciting atmosphere during this time of year which is always a welcome "exception to the norm" of the hussle and bussle. I hope all on these forums get just what they want for LEGO this year! EARN 50 VIP BONUS POINTS! Offer is valid 1st to 30th November 2013, in LEGO Stores, via LEGO.com/shop or orders over the phone. Offer applies to items 75013 and 31011 only. For online and telephone orders, points are attributed to the account once payment is received. Points will not be credited retrospectively for purchases made prior to, or after this promotion. Points will not be earned on any applicable taxes or shipping charges. Offer cannot be combined with any other VIP offer, discount or coupon. Offer not valid at LEGOLAND Discovery Centres or LEGOLAND Parks. 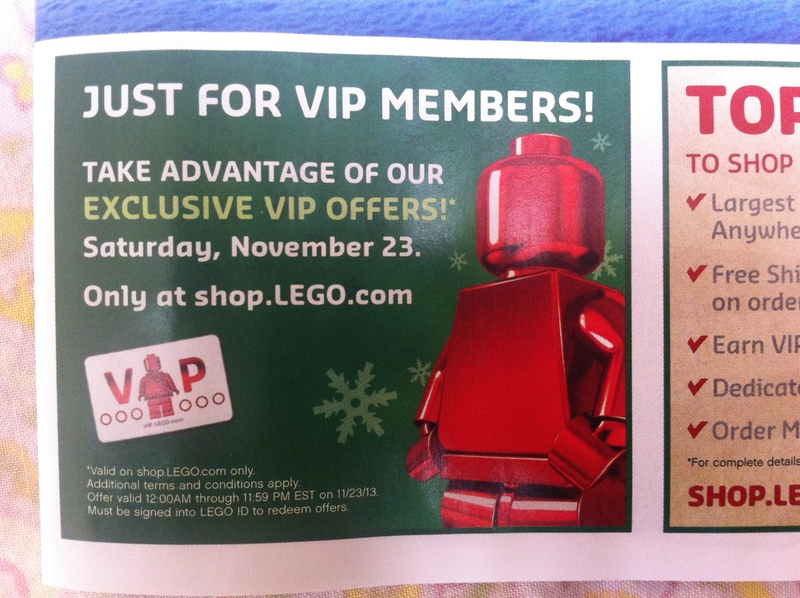 The LEGO Group reserves the right to amend or cancel this promotion at any time without prior notice. Subject to availability. Well I went ahead and got the DeLorean for my brother-in-law for Christmas. Free shipping + $5 VIP for me later isn't too shabby. Kept thinking about adding other things to get the free truck but decided to wait and see if sales will happen next week. I got the Technic Crane. I figured it was as close to a good deal that I will get on the set, when you figure in the Ltd Ed Christmas set and the extra 5% off with my Discover card. Lego site is so busy i can't get in to order! Shoveling some snow then I'll try again. ^Yeah, server seems to be down. I can't get on the U.S. site either. Yep, totally fallen over. Not sure why, it's not a particularly good deal. Can't access it either. I received an email this morning offering #40083 but there was no mention of triple points, is that universal? There wasn't any offer of triple points for me (UK). FREE EXCLUSIVE CHRISTMAS TREE TRUCK! This is what I got in an email. I'm a U.S. customer. 10% discount but it doesn't stack with the 10% off the x-wing deal or earlier in the day with the 20% off the b-wing? Is that right or is it just me? Like I mentioned on the front page article: Someone needs to clarify/find out if these are the same deals we are getting on Brick Friday/Weekend. Lego site down here. I will keep trying! Site is back-up in the US. Got in finally. No discounts on any of the sets mentioned here. So i finally caved to the completion bug and picked up Town Hall for a hefty Triple VIP score! Only way to know this is if you know someone on the inside, otherwise you have to decide by 11:59 tonight if you want the current known deal or if you want to take your chances for a better deal on BF. Basically, it's what you see or trade for what's behind the curtain. The choice is yours. Good point, and yes I do know someone who works at the store here in Columbus. Basically, it's what you see or trade for what's behind the curtain. The choice is yours. It's like playing on Let's Make a Deal. ^^I'm not sure that someone who just works in a store is "inside" enough to be privy to this info. But if it is, why not contact them now and report back. This is the same deal as BF only on BF online orders over $149 will get the $10 GC as well. Also some slow moving non-exclusive sets and items will be 20% off or so on BF. Talked to the manager at my local store here in the US and she said Triple VIP will NOT be next weekend. So I went ahead and placed an order. Got Winter Market, Creator Eagle, Decorating the Tree, Council of Elrond(sp?) and Castle Dragon. You can always return things to Lego for a full refund. If to a store, it's just gas and time, if to [email protected], it's your dime to ship back. So, if you bought today and find a better deal BF, grab it and simply return today's purchases. Yes you will be out the return shipping, but that's only $10-$20 or so (depends on what you got, of course), which you can factor into the "new deal" if you decided to go for it on BF. ^Yes, but as he found out the hard way, you can't do any of the above w/o a receipt!